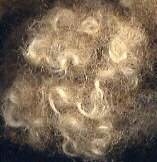 Of the three rare breed fleece samples I have to work on for my rare breed sweater, I've just finished spinning the Manx Loghtan. Modern day Manx Loghtan sheep are found mostly on the Isle of Man. They descended from a Scottish primitive breed once found on the Scottish mainland and costal islands of Britain. I found a picture of the breed at OSU's website. Four horns are common, but individuals can have 2 to 6 horns. The staples in my sample measured 2 to 2 and a half inches long. The crimp was not definable. The color is a lovely reddish brown with blond bleached tips. The staple was sound and the tips not tender, though they were harsher to touch. Because of this harshness, I might have considered trimming them off to improve the hand of the yarn. However, I loved the little curls they made, and wanted to incorporate the range of color in my yarn. So I spun the fleece with the tips. 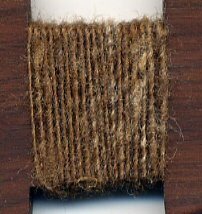 The fleece was wonderfully open and didn't require anything more than washing to prepare for spinning. It contained some grease, but no VM (vegetable matter) and very few second cuts. To spin, I simply teased a few locks at a time and drafted them out of my hand. My singles measured approximately 18 WPI. From the photo on the left you can see the blond color from the tips incorporated into the yarn. I'm hoping some of this will show up in the knitted sheep motif I plan to use for this sweater. My 2-ply measures 10 WPI. The hand of the yarn is too harsh for next-to-skin wear but will be suitable in a small amount on an outerwear cardigan. Traditionally the yarn is used for hosiery and knitted outerwear. Lastly, I knitted up a small swatch in moss stitch, because I was curious! I find that knitting a yarn gives me a lot of information about it that the skein by itself doesn't. I think it will work very nicely for one small knitted sheep motif. There is quite a range of colors in the yarn and they all show up well in the swatch. It will be perfect for the sheep. I feel as though I need to write all this down. I'm such a beginner at spinning and you obviously know exactly what you're doing. It's really beautiful. I love the highlights it shows in the moss stitch. 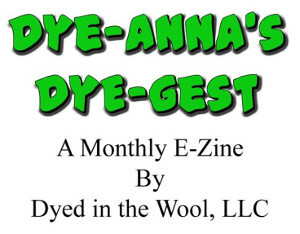 Posted about felted soap on the blog. Check it out. Wonderful tutorial and pics. 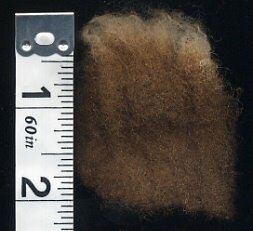 Very intresting fiber(I have Manx cats) The silk blends in the previous post are also wonderful.